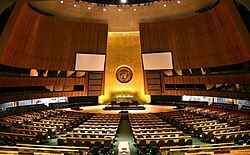 The United Nations General Assembly (UNGA or GA; French: Assemblée générale, AG) is one of the six principal organs of the United Nations (UN), the only one in which all member nations have equal representation, and the main deliberative, policy-making, and representative organ of the UN. Its powers are to oversee the budget of the UN, appoint the non-permanent members to the Security Council, appoint the Secretary-General of the United Nations, receive reports from other parts of the UN, and make recommendations in the form of General Assembly Resolutions. It has also established numerous subsidiary organs. The General Assembly currently meets under its president or secretary-general in annual sessions at the headquarters of the United Nations in New York City, the main part of which lasts from September to December and part of January until all issues are addressed (which often is just before the next session's start). It can also reconvene for special and emergency special sessions. Its composition, functions, powers, voting, and procedures are set out in Chapter IV of the United Nations Charter. The first session was convened on 10 January 1946 in the Methodist Central Hall in London and included representatives of 51 nations. Voting in the General Assembly on certain important questions, namely, recommendations on peace and security, budgetary concerns, and the election, admission, suspension or expulsion of members is by a two-thirds majority of those present and voting. Other questions are decided by a straightforward majority. Each member country has one vote. Apart from approval of budgetary matters, including adoption of a scale of assessment, Assembly resolutions are not binding on the members. The Assembly may make recommendations on any matters within the scope of the UN, except matters of peace and security under Security Council consideration. The one state, one vote power structure potentially allows states comprising just five percent of the world population to pass a resolution by a two-thirds vote. During the 1980s, the Assembly became a forum for the "North-South dialogue:" the discussion of issues between industrialized nations and developing countries. These issues came to the fore because of the phenomenal growth and changing makeup of the UN membership. In 1945, the UN had 51 members. It now has 193, of which more than two-thirds are developing countries. Because of their numbers, developing countries are often able to determine the agenda of the Assembly (using coordinating groups like the G77), the character of its debates, and the nature of its decisions. For many developing countries, the UN is the source of much of their diplomatic influence and the principal outlet for their foreign relations initiatives. 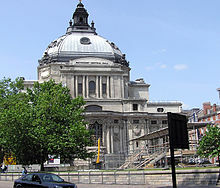 Methodist Central Hall, London, the location of the first meeting of the United Nations General Assembly in 1946. The first session of the UN General Assembly was convened on 10 January 1946 in the Methodist Central Hall in London and included representatives of 51 nations. The next few annual sessions were held in different cities: the second session in New York City, and the third in Paris. It moved to the permanent Headquarters of the United Nations in New York City at the start of its seventh regular annual session, on 14 October 1952. In December 1988, in order to hear Yasser Arafat, the General Assembly organized its 29th session in the Palace of Nations, in Geneva, Switzerland. All 193 members of the United Nations are members of the General Assembly, with the addition of Holy See and Palestine as observer states. Further, the United Nations General Assembly may grant observer status to an international organization or entity, which entitles the entity to participate in the work of the United Nations General Assembly, though with limitations. The agenda for each session is planned up to seven months in advance and begins with the release of a preliminary list of items to be included in the provisional agenda. This is refined into a provisional agenda 60 days before the opening of the session. After the session begins, the final agenda is adopted in a plenary meeting which allocates the work to the various Main Committees, who later submit reports back to the Assembly for adoption by consensus or by vote. Items on the agenda are numbered. Regular plenary sessions of the General Assembly in recent years have initially been scheduled to be held over the course of just three months; however, additional work loads have extended these sessions until just short of the next session. The routinely scheduled portions of the sessions normally commence on "the Tuesday of the third week in September, counting from the first week that contains at least one working day", per the UN Rules of Procedure. The last two of these Regular sessions were routinely scheduled to recess exactly three months afterwards in early December, but were resumed in January and extended until just before the beginning of the following sessions. The General Assembly votes on many resolutions brought forth by sponsoring states. These are generally statements symbolizing the sense of the international community about an array of world issues. Most General Assembly resolutions are not enforceable as a legal or practical matter, because the General Assembly lacks enforcement powers with respect to most issues. The General Assembly has authority to make final decisions in some areas such as the United Nations budget. General Assembly Resolutions are generally non-binding on member states, but carry considerable political weight, and are legally binding towards the operations of the General Assembly. The General Assembly can also refer an issue to the Security Council to put in place a binding resolution. From the First to the Thirtieth General Assembly sessions, all General Assembly resolutions were numbered consecutively, with the resolution number followed by the session number in Roman numbers (for example, Resolution 1514 (XV), which was the 1514th numbered resolution adopted by the Assembly, and was adopted at the Fifteenth Regular Session (1960)). Beginning in the Thirty-First Session, resolutions are numbered by individual session (for example Resolution 41/10 represents the 10th resolution adopted at the Forty-First Session). The General Assembly also approves the budget of the United Nations and decides how much money each member state must pay to run the organization. The Charter of the United Nations gives responsibility for approving the budget to the General Assembly (Chapter IV, Article 17) and for preparing the budget to the Secretary-General, as "chief administrative officer" (Chapter XV, Article 97). The Charter also addresses the non-payment of assessed contributions (Chapter IV, Article 19). The planning, programming, budgeting, monitoring and evaluation cycle of the United Nations has evolved over the years; major resolutions on the process include General Assembly resolutions: 41/213 of 19 December 1986, 42/211 of 21 December 1987, and 45/248 of 21 December 1990. The budget covers the costs of United Nations programmes in areas such as political affairs, international justice and law, international cooperation for development, public information, human rights, and humanitarian affairs. The main source of funds for the regular budget is the contributions of member states. The scale of assessments is based on the capacity of countries to pay. This is determined by considering their relative shares of total gross national product, adjusted to take into account a number of factors, including their per capita incomes. Division of the General Assembly by membership in the five United Nations Regional Groups. The General Assembly votes in elections for the ten non-permanent members of the United Nations Security Council; the most recent such election was on 2 June 2017. These elections take place every year, and member states serve two-year terms, with five replaced each year. The candidates are selected by their regional groups. The General Assembly also elects members of the United Nations Economic and Social Council. It also elects members of the United Nations Industrial Development Organization, and some members of the United Nations Trusteeship Council. The General Assembly appoints the Secretary-General of the United Nations on recommendation of the Security Council, and adopts rules governing the administration of the Secretariat. Along with the Security Council, the General Assembly elects Judges for the International Court of Justice in The Hague. Special sessions may be convened at the request of the United Nations Security Council, or a majority of UN members, or, if the majority concurs, of a single member. A special session was held on October 1995 at the head of government level to commemorate the UN's 50th anniversary. Another special session was held in September 2000 to celebrate the millennium; it put forward the Millennium Development Goals. A special session was again held to discuss and admit proposals for the HIV/AIDS crisis in 2001. A further special session (2005 World Summit) was held in September 2005 to commemorate the UN's 60th anniversary; it assessed progress on the Millennium Development Goals, and discussed Kofi Annan's In Larger Freedom proposals. Another special session was held in 2014 to discuss Population and Development, following the International Conference on Population and Development Programme of Action. A special session was held in 2016 to discuss the War on Drugs and proposals to reconsider international drug treaties like the Single Convention on Narcotic Drugs, as well as how to deal with drug treatment, rehabilitation, and related matters. This was the first UN gathering on the subject in 20 years. In 2016, while "some European and South American countries as well as the U.S. favored softer approaches[,] ... countries such as China and Russia and most Muslim nations like Iran, Indonesia and Pakistan remained staunchly opposed" to any move beyond prohibition. One group favouring reform, the Global Commission on Drug Policy, and some attendees, expressed disappointment with the "status quo" outcome. Presenters included Russel Simmons, Michael Skolnik, Che Rhymefest Smith, who screened the film WARonUS, directed by Queen Muhammad Ali and Hakeem Khaaliq. Brazilian President Dilma Rousseff delivers the opening speech at the 66th Session of the General Assembly on 21 September 2011, marking the first time a woman opened a United Nations session. At the first Special Session of the UN General Assembly held in 1947, Osvaldo Aranha, then president of the Special Session, began a tradition that has remained until today whereby the first speaker at this major international forum is always a Brazilian. If the Security Council fails to act to maintain international peace and security due to a disagreement between its permanent members, the General Assembly has the power to convene an emergency special session and act to ensure peace and security under United Nations General Assembly Resolution 377. Annually, Heads of State, Government or heads of delegations speak at the opening of the new session of the General Assembly during the "General Debate". The General Assembly may take action on maintaining international peace and security if the United Nations Security Council is unable, usually due to disagreement among the permanent members, to exercise its primary responsibility. If not in session at the time, the General Assembly may meet in emergency special session within 24 hours of the request. Such emergency special sessions are to be called if requested by the UN Security Council on the vote of any seven members, or by a majority of the Members of the United Nations. The "Uniting for Peace" resolution, adopted 3 November 1950, empowered the Assembly to convene in emergency special session in order to recommend collective measures, including the use of armed force, in the event of a breach of the peace or an act of aggression. As with all Assembly resolutions, two-thirds of UN Members "present and voting" must approve any such recommendation before it can be formally adopted by the Assembly. Emergency special sessions have been convened under this procedure on ten occasions. The two most recent, in 1982 and 1997–2017, were about the status of the territories occupied by the State of Israel. The General Assembly subsidiary organs are divided into five categories: committees (30 total, six main), commissions (six), boards (seven), councils (four) and panels (one), working groups, and "other". The roles of many of the main committees have changed over time. Until the late 1970s, the First Committee was the Political and Security Committee (POLISEC) and there was also a sufficient number of additional "political" matters that an additional, unnumbered main committee, called the Special Political Committee, also sat. The Fourth Committee formerly handled Trusteeship and Decolonization matters. With the decreasing number of such matters to be addressed as the trust territories attained independence and the decolonization movement progressed, the functions of the Special Political Committee were merged into the Fourth Committee during the 1990s. Each main committee consists of all the members of the General Assembly. Each elects a chairman, three vice chairmen, and a rapporteur at the outset of each regular General Assembly session. Credentials Committee – This committee is charged with ensuring that the diplomatic credentials of all UN representatives are in order. The Credentials Committee consists of nine Member States elected early in each regular General Assembly session. General Committee – This is a supervisory committee entrusted with ensuring that the whole meeting of the Assembly goes smoothly. The General Committee consists of the president and vice presidents of the current General Assembly session and the chairman of each of the six Main Committees. Other committees of the General Assembly are enumerated. Despite its name, the former United Nations Commission on Human Rights (UNCHR) was actually a subsidiary body of ECOSOC. The newest council is the United Nations Human Rights Council, which replaced the aforementioned UNCHR in March 2006. There are a total of four councils and one panel. There is a varied group of working groups and other subsidiary bodies. Countries are seated alphabetically in the General Assembly according to English translations of the countries' names. The country which occupies the front-most left position is determined annually by the Secretary-General via ballot draw. The remaining countries follow alphabetically after it. On 21 March 2005, Secretary-General Kofi Annan presented a report, In Larger Freedom, that criticized the General Assembly for focusing so much on consensus that it was passing watered-down resolutions reflecting "the lowest common denominator of widely different opinions". He also criticized the Assembly for trying to address too broad an agenda, instead of focusing on "the major substantive issues of the day, such as international migration and the long-debated comprehensive convention on terrorism". Annan recommended streamlining the General Assembly's agenda, committee structure, and procedures; strengthening the role and authority of its president; enhancing the role of civil society; and establishing a mechanism to review the decisions of its committees, in order to minimize unfunded mandates and micromanagement of the United Nations Secretariat. Annan reminded UN members of their responsibility to implement reforms, if they expect to realize improvements in UN effectiveness. The reform proposals were not taken up by the United Nations World Summit in September 2005. Instead, the Summit solely affirmed the central position of the General Assembly as the chief deliberative, policymaking and representative organ of the United Nations, as well as the advisory role of the Assembly in the process of standard-setting and the codification of international law. The Summit also called for strengthening the relationship between the General Assembly and the other principal organs to ensure better coordination on topical issues that required coordinated action by the United Nations, in accordance with their respective mandates. A United Nations Parliamentary Assembly, or United Nations People's Assembly (UNPA), is a proposed addition to the United Nations System that eventually could allow for direct election of UN parliament members by citizens all over the world. In the General Debate of the 65th General Assembly, Jorge Valero, representing Venezuela, said "The United Nations has exhausted its model and it is not simply a matter of proceeding with reform, the twenty-first century demands deep changes that are only possible with a rebuilding of this organisation." He pointed to the futility of resolutions concerning the Cuban embargo and the Middle East conflict as reasons for the UN model having failed. Venezuela also called for the suspension of veto rights in the Security Council because it was a "remnant of the Second World War [it] is incompatible with the principle of sovereign equality of States". Reform of the United Nations General Assembly includes proposals to change the powers and composition of the U.N. General Assembly. This could include, for example, tasking the Assembly with evaluating how well member states implement UNGA resolutions, increasing the power of the assembly vis-à-vis the United Nations Security Council, or making debates more constructive and less repetitive. The annual session of the United Nations General Assembly is accompanied by independent meetings between world leaders, better known as meetings taking place on the sidelines of the Assembly meeting. The diplomatic congregation has also since evolved into a week attracting wealthy and influential individuals from around the world to New York City to address various agendas, ranging from humanitarian and environmental to business and political. ^ CHARTER OF THE UNITED NATIONS: Chapter IV Archived 12 October 2007 at the Wayback Machine. United Nations. ^ General Assembly: Subsidiary organs at UN.org. ^ United Nations Official Document. "The annual session convenes on Tuesday of the third week in September per Resolution 57/301, Para. 1. The opening debate begins the following Tuesday". www.un.org. ^ a b General Assembly of the United Nations. United Nations. Retrieved 12 July 2013. ^ a b Population, total | Data | Table. World Bank. Retrieved 12 July 2013. ^ "History of United Nations 1941 – 1950". United Nations. Archived from the original on 12 March 2015. Retrieved 12 March 2015. ^ (in French) "Genève renoue avec sa tradition de ville de paix", Le Temps, Thursday 16 January 2014. ^ "Research Guide: General Assembly". United Nations. Archived from the original on 21 October 2013. ^ "General Assembly of the United Nations". ^ "Article 17 (1) of Charter of the United Nations". ^ "Articles 11 (2) and 11 (3) of Charter of the United Nations". ^ UN Security Council : Resolutions, Presidential Statements, Meeting Records, SC Press Releases Archived 2 December 2012 at the Wayback Machine. United Nations. Retrieved 12 July 2013. ^ United Nations Department of Management. United Nations. Retrieved 12 July 2013. ^ "Articles 18 (2) and 23 (1) of Charter of the United Nations". ^ "Article 20 of Charter of the United Nations". ^ "UN GA Special Session on HIV/AIDS". United Nations. Retrieved 16 December 2015. ^ "Event: Special Session of the General Assembly on the Follow-Up to the Programme of Action of the ICPD | Sustainable Development Policy & Practice | IISD Reporting Services". sd.iisd.org. Retrieved 16 December 2015. ^ "Special Session of the General Assembly UNGASS 2016". unodc.org. Retrieved 16 December 2015. ^ Fassihi, Farnaz, "U.N. Conference on Drugs Ends Without Shift in Policy", Wall Street Journal, 22 April 2016. Retrieved 25 April 2016. ^ Belk, Joey (19 March 2016). "How to travel in one of the most dangerous cities in the world and still be fresh". Nation19 Magazine / APDTA. Nation19 Magazine / APDTA. Retrieved 2 February 2017. ^ "The Museum of Drug Policy Wants You to Speak Your Truth | Mass Appeal". Mass Appeal. 20 April 2016. Retrieved 3 February 2017. ^ "Brazil's President Rousseff to be First Woman to Open United Nations". Fox News Channel. 20 September 2011. Retrieved 29 September 2015. ^ "Historical Personalities and Diplomats: Oswaldo Aranha". Brazilian Ministry of External Relations. ^ "UN: King Felipe VI of Spain and Ban Ki-moon Discuss Western Sahara". Morocco World News. 24 September 2014. Retrieved 25 September 2014. ^ "In U.N. Speech, Obama Vows to Fight ISIS 'Network of Death'". The New York Times. 24 September 2014. Retrieved 25 September 2014. ^ UNGA Emergency Special Sessions. United Nations. ^ Tenth Emergency Special Session. United Nations. Retrieved 13 November 2014. ^ a b "Main Committees". United Nations General Assembly. United Nations. Retrieved 19 June 2018. ^ "Subsidiary Organs of the General Assembly: Committees". United Nations General Assembly. United Nations. Retrieved 19 June 2018. ^ "Subsidiary Organs of the General Assembly: Commissions". United Nations General Assembly. United Nations. Retrieved 19 June 2018. ^ "Subsidiary Organs of the General Assembly: Boards". United Nations General Assembly. United Nations. Retrieved 19 June 2018. ^ "Subsidiary Organs of the General Assembly: Assemblies and Councils". United Nations General Assembly. United Nations. Retrieved 19 June 2018. ^ "Subsidiary Organs of the General Assembly: Working Groups". United Nations General Assembly. United Nations. Retrieved 19 June 2018. ^ The PGA Handbook: A practical guide to the United Nations General Assembly (PDF). Permanent Mission of Switzerland to the United Nations. 2011. p. 18. ISBN 978-0-615-49660-3. ^ "Report of the Secretary-General in Larger Freedom towards development, security and human rights for all". ^ "In Larger Freedom, Chapter 5". United Nations. ^ Assembly, General. "Venezuela, Bolivarian Republic of H.E. Mr. Jorge Valero Briceño, Chairman of the Delegation". www.un.org. ^ "REVITALIZATION OF THE WORK OF THE GENERAL ASSEMBLY" (PDF). Globalpolicy.org. Retrieved 11 January 2015. ^ "The Role of the UN General Assembly". Council on Foreign Relations. Retrieved 11 January 2015. ^ David Gelles (21 September 2017). "It's the U.N.'s Week, but Executives Make It a High-Minded Mingle". The New York Times. Retrieved 22 September 2017. 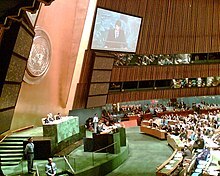 Wikimedia Commons has media related to United Nations General Assembly.